Several new Chains of Promathia area quests have been added. A special new Ballista area has been added. New sets of low-level equipment have been added to the list of armor that can be stored by certain NPCs located around Vana�diel. After trading a full set (4-5 pieces) of armor, a player will receive a �claim slip.� This claim slip and a small fee are required when having a set of armor returned. 1. Signatures on checked armor will be lost. 2. High-quality and refurbished armor cannot be stored. 1. A larger bucket offered to those who can fill the original bucket to the brim without going over its weight limit. 2. A larger variety of items that can be dug from the sand. 3. Less waiting time required to re-clam the same points. A new key item that will automatically inform players whether they have access to the Marble Bridge Tavern is now available (a message will appear upon entry into Upper Jeuno). A new key item that will automatically inform players if a volunteer is needed for the �Community Service� quest is now available. Under certain conditions, Tarnotik (located in Oldton Movalpolos) will now accept snow lilies as payment for teleportation to Mine Shaft #2716. The number of items accepted by Yurim in the Tavnazian quest "In the Name of Science," as well as the types of rewards granted in exchange, have been increased. Several new varieties of fish are now being accepted by Zaldon in the �Inside the Belly� quest. The amount of EXP required for leveling up after lv.51, and the amount of EXP lost when KO�d after level 25, has been greatly reduced. Please note that at the time of the version update, if your character has more EXP than the new amount required, your EXP total will be adjusted to 1 point less than the amount needed for level up. Please visit http://www.playonline.com/ff11/index.shtml for further details on changes to the EXP system. Several new types of ENM quests have been added. In addition, many of the existing quests have also been adjusted. Some of these adjustments include allowing larger parties and/or alliances to enter the battlefields (however, depending on the size of the parties, there may be a cut in the amount of EXP received when completing the quest). The recommended number of party members for all existing ENM battles has been set at 6, with the maximum alliance size being 18. New notorious monsters have been added to the Chains of Promathia areas. The bard song Army's Paeon V (Lv. 65) has been added. Select guilds are now offering new key items available for purchase with guild points. Adjustments and additions have been made to the types of items requested in exchange for guild points. The Alchemists� Guild will now accept poison baghnakhs +1 in exchange for guild points. Several new fishing rods have been introduced. New relic-type equipment has been added. Numerous other types of items are also now available. New synthesis and desynthesis recipes have been added. A new synthesis recipe for black ink has been introduced. In conjunction with this addition, the item's buying price has also been adjusted. The Handle Name screen that would appear during login has been removed. In its place, a simple confirmation message has been introduced. Group Messages can now be viewed while logged in to FINAL FANTASY XI. However, players must return to PlayOnline to respond to them. Several unused buttons within the Friend List menu, as well as the "Busy" and �Away Mess.� options under Online Status, have been removed. In conjunction with the removal of the corresponding button, a player�s �Privacy Level� will now automatically be set to level 2 (all players on your Friend List). The "Accept" button originally used during Friend List registration has been removed. The current options are "Accept & Add" and "Decline." Also, when "Accept & Add" is selected by the invitee, both players will be automatically registered on each other's Friend List. "/busy" has been removed from the Auto-Translate feature. A confirmation message will now appear when purchasing goods from another player�s bazaar. Example: Purchase 3 sleepshrooms for 570 gil? The more �tired� a player becomes after repeated fishing, the longer it will now take to recast his or her line. Players will be �tired� for a short period of time after being raised. New BGM is now played when battling it out with a bite. New types of salt and freshwater fish, as well as rare �legendary� fish, have been added. When a monster is caught, only the player who reeled it in (and his/her party or alliance) will be able to attack it (the monster's name will be displayed in red/purple). A handful of updates here, to get ready for the patch on Wednesday. Assuming the April 20 patch contains all the major changes for this month, we will be making the standard Compilation of Info with the details. If the patch goes through as currently scheduled, we should have the first round of items up by Wednesday evening, with further updates following in the days and weeks ahead. 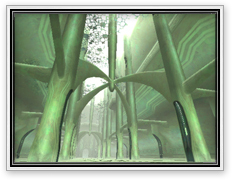 At the following time, we will be performing FINAL FANTASY XI server maintenance on all worlds. During this period, FINAL FANTASY XI will be unavailable. Also the application form for Return Home to Vana'diel campaign will be unavailable. *The client software will also be updated at this time. Once this maintenance is completed, the client update will start automatically after logging back into FINAL FANTASY XI. Please follow the instructions that appear on your screen. *For update details, please refer to the Topics in FINAL FANTASY XI web site on PlayOnline.com (http://www.playonline.com/). More specific details will be available on Apr. 20. *Maintenance completion time may be subject to change. From new quests and items to adjustments in mining and harvesting, the April version update will bring dozens of exciting changes in several different areas. The following is a list of just a few of the changes that await our adventurers! New items can soon be found in Newton Movalpolos, Giddeus, and West Sarutabaruta. Numerous new quests will be available in Tavnazia, Jeuno, and other familiar locations. When in possession of this special item, a message will automatically inform players whether or not they have access to the Marble Bridge Tavern in Upper Jeuno. The veil is about to be lifted on several new pieces of relic-style armor. The FINAL FANTASY XI development team is currently working on several new areas to be released in the upcoming version update. What adventures await you in these unexplored new lands? Click here to have a sneak peek! Our next version update will implement changes to the experience system. These changes will be applicable to players who are level 51 and above. The number of experience points required to gain each level was originally calculated after considering players' effects on the world of Vana'diel as they progressed beyond the initial level cap of 50. However, a considerable amount of time has passed since the implementation of the final cap of 75, and players beyond level 50 no longer have the same influence on the balance of the game. After a close review, the FINAL FANTASY XI development team has decided to reduce the amount of experience needed for leveling up after reaching level 51 (levels 1-50 will remain the same, however). -Experience points lost due to KO. Starting at level 25, experience points lost after being KO'd will be 8% of the amount needed to reach the next level. However, this value will never exceed 2,400. 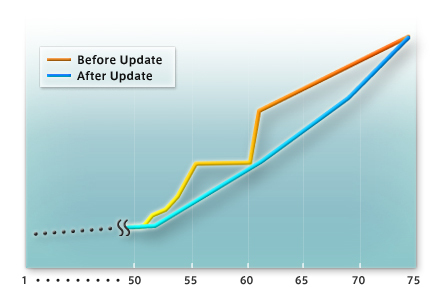 At the time of the version update, if a player's currently accumulated experience points exceed the number required for the newly adjusted level, that player's experience points will be reset to one point below the number needed to gain a level. New content and system-related adjustments are under constant consideration by the FINAL FANTASY XI development team to ensure a balanced playing experience in the evolving world of Vana'diel. Further details will be provided on the day of the update. It has come to our attention that recent technical difficulties with our PlayOnline server are due to a DDoS from anonymous third parties. Our technicians are currently conducting a counter-measure on the issue. During this period, search, auction house function or login difficulties may occur. If you have encountered any of the above issues, please retry after a period of time. We ask for your understanding and cooperation as we strive to maintain the best service possible. Thank you. This is an announcement about PlayOnline network technical difficulties since Apr. 9, 2005. It has come to our attention that recent technical difficulties with our PlayOnline server are due to a DDoS from anonymous third parties. We have determined that this activity was undertaken with malicious intent and specifically targeted our network. Our technicians are taking every measure possible to prevent further attacks. However, attack methods have varied, which has caused a more time-consuming review of our network protection. Currently we are unable to determine the precise source of attack. However, with the cooperation of ISP companies, our investigation continues to make progress. Law enforcement authorities in Japan, the United States, and Europe have been contacted for support. We chose not to make an announcement of this nature earlier due to the unwanted effect it could have on our investigation, on the investigations of authorities abroad, and for stopping information that could be used to undertake additional network attacks. The most recent server difficulties and PlayOnline service interruption, however, have persuaded us to disclose more information on this matter to our users. We deeply apologize for the inconvenience these attacks have caused in recent days. Attacks continue at this hour in intervals and we regret that our investigation cannot allow for estimates as to when we expect service to return to optimal levels. Our technicians will continue to select the most effective measures available as we work with local and international authorities to take legal action against those obstructing PlayOnline service. We ask for your understanding and cooperation as we strive to maintain the best service possible. Thank you. We have experienced technical difficulties with PlayOnline and FINAL FANTASY XI from April 14 at 1:30 (PDT). The issues have been addressed by the recovery operation that took place from 4:00 to 8:00 (PDT). We deeply apologize for any inconvenience. The technical difficulties that took place today were due to malfunctioning network equipment which caused instability that lead to connection loss between servers. The network equipment which caused this issue has been repaired. Regarding the technical difficulties from last weekend, we are working on ways to provide more stable service and faster response by upgrading system surveillance and taking other measures. We ask for your understanding and cooperation as we strive to provide better service. Thank you. A variety of updates and site improvements have gone in, including a number of additions to the site interface to increase the flexibility of the databases which hold the site info. The Mob Database Search was given the options of searching for a list of mobs that do not contain NMs or Fished monsters, as well as searching by a stricter mob level limit. The powerful Advanced Item Search was given a slew of refining search options, dealing with items that: have Rare, Exclusive, or Temporary flags; have Latent, Enchantment, or Dispensing effects. These all have three options: Yes, No, and Either. The default Either option allows the search to go through like normal, with those items included in the search result. The Yes option will list only the items that have that flag or effect. The No option will exclude any items with the specified flag or effect. This allows for targetted searches, such as every Rare/Ex melee weapon or all Paladin equipment with Latent effects. A handful of food items were updated, including all the rest of the food items added in the February patch, as listed in the Feb. 2005 FFXI Patch Compilation of Info. All the changed food items, and some new recommended foods, were added in the Food Effects Guide. With the recent problems across the FFXI servers, it seems worth mentioning the places to check for information on the current status of the servers. The best place to check for any current problems in the game is at the PlayOnline Current FFXI News. The Server Maintenance section there lists any known issues with the game, whether it involves the login servers, AH/Chat servers, or the main game servers. Square-Enix reliably posts information as a problem occurs, so it's easy to tell if there's a widespread issue or not. There is also a page with a simple display of Server Status which is automatically updated 5 minutes. This only reflects the status of the game servers, however, so it is of little use when players can't even get through the login server. Both of these links, as well as other FFXI status links, can be found in our FFXI Links Resource Repository section. Hopefully the overall game server situation will stabilize in the near future, so there isn't the sort of interruptions in FFXI service that we've had to deal with recently. Whenever there are issues with the game, be sure to check out these links for the official info on what's happening. Calling all Ballista freaks! In the version update coming later this month, the development team will be introducing an all-new area just for you! Up until now, Ballista has been a one-way street. Players could only participate in nationally sponsored matches located in areas determined by the IRNC. But now, with the opening of a new area designed specially for Ballista, adventurers from all over the world can take the excitement into their own hands. *Area Reservation--reserve the area for you and your friends! *Rule Adjustment--set various rules such as match length, level restrictions, and more! While installation of the Chains of Promathia expansion pack is required to access the new Ballista area, progression in the missions is not necessary. However, a small amount of gil and/or Ballista Points may be requested before utilizing several of the services. New Equipment, Synthesis Recipes, and More! In our next version update we will be introducing new equipment and synthesis recipes, as well as additional items to purchase with your guild points. Click here for a preview of the latest gear! Further details will be announced at the time of the version update. As well as special poses for each of the races! Keep an eye out for more information on mannequins in the coming weeks! The FINAL FANTASY XI development team is currently working on a plethora of new changes to the fishing system. New music will play when battling it out with "the big one." The number of types of fish accepted for the "Inside the Belly" quest has been increased. The New and Improved Friend List! The PlayOnline Friend List is now more convenient and easy to use than ever. In addition to My Friend List*, the newly added Group Friend List allows you to communicate with your friends in more diverse ways, with functions such as displaying each group member's personal comments on each list. *The Friend List has been renamed to "My Friend List." Just like My Friend List, the Group Friend List allows you to share information such as personal comments and portraits, regardless of each member's online status. In addition, there are new functions specific to friend groups, such as "Group Message" and "Group Chat." For example, if you invite FINAL FANTASY XI linkshell members into a friend group, the linkshell members will be able to communicate with each other outside of the game. Even members who log in at different times can use "Comments" and other functions to casually communicate with each other. *The Friend List shown here corresponds to the PlayOnline Viewer update of March 3rd 2005. For details, please refer to "The New and Improved PlayOnline!" section of "Quick Manuals." *The Friend List that will appear in games such as FINAL FANTASY XI may have different designs and controls than the PlayOnline Friend List. On March 3rd, the PlayOnline Viewer Friend List was updated with several new and exciting features such as the Group Friend List. These additions are also scheduled to be implemented within FINAL FANTASY XI later this spring. Dreamer vs. Dreamer: A Fight to the Death!? The rest of the equipment from the Feb. 23 patch that didn't have drop or crafting info now has information on how to obtain them. All items from the patch are now accounted for, whether a drop from an ENM, a new NM, or crafted. They can all be seen with full drop info in the Feb. 2005 FFXI Patch Compilation of Info. The ENM Guide has been updated further, with full info on the Vision and Image items that are dropped in ENMs, and can be exchanged for useful items. More drop info and directions were added to the individual ENM guides. Many of the items that are obtained through the ENM Reward Exchange were updated specifically with details on how to obtain them. The recent changes to the Shield skill are now detailed in a new Shield Skill Revamp section of the Feb. 2005 FFXI Patch Compilation of Info. All shield items now have their new Shield Size listed on them. A number of recipes were updated or added, to keep the recipe information as accurate as possible. All of the zones were updated with more complete exit info, as well as full weather patterns.